I've become addicted to Foodgawker. At one point I had over 600 items in my favorites, and I've found so many wonderful blogs and recipes. Found this simple recipe on one of my morning blogwalks, and threw it together to have with grilled hot dogs yesterday. I totally cheated and added the chopped jalapeno and garlic to the butter and melted it in the microwave. I used my trusty corn stripper to make short work of removing the kernels :) This was simple and delicious. You could also add the ingredients to softened butter, form it into logs and freeze so that you have it ready to go, I plan on doing that for our upcoming vacation! I found this on the Life's Ambrosia blog, this is my 2nd or 3rd winner from there, and I've barely made a dent in checking out all the recipes on the site. :) Definitely go check it out! Preheat your grill on the high setting. Wrap the corn cobs in aluminum foil. Cook on hot grill for 15 minutes, turning occasionally. Remove from heat. Allow to cool for several minutes. Meanwhile, melt butter in a small sauce pan. Once melted add jalapeno and garlic and cook for 3 minutes or until jalapeno is softened. Once corn has cooled enough to handle it, remove the aluminum foil. Holding the corn upright, use a sharp knife to cut the kernels from the cob. (Note: I would do this into a bowl so you don’t have kernals flying everywhere. I learned the hard way). 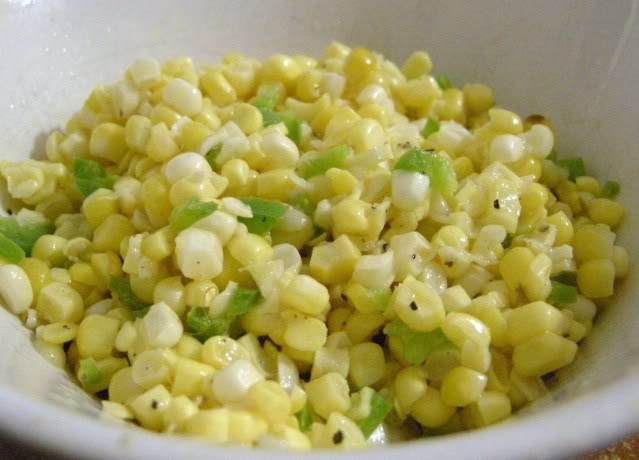 Once all of the kernels are cut from the cob, toss them with the butter mixture. Sprinkle with salt and pepper and serve.